This is only one data point but I thought it was interesting. About a month ago, my wife launched a website called Activity Yard. It’s a website community where parents rate and review activities for their kids. The URL was submitted to Google and Bing on the same day in August. Out of sheer curiosity, I started to check the rate at which the two search engines spidered the site. Fast forward about 4 weeks, and the results are interesting – Google spidered 3,000 times more pages than Bing. 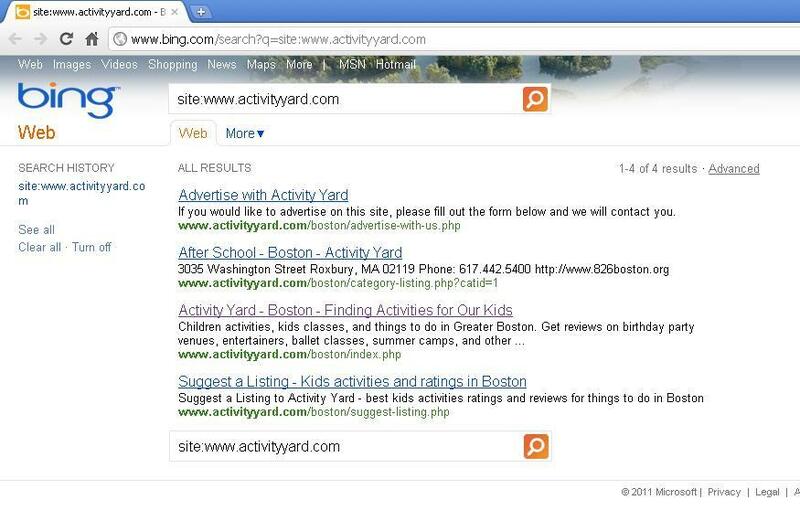 You can see in this image – Google has spidered “about 12,000” pages on a site search of Activity Yard. Now, here’s Bing’s result taken on exactly the same day (today). It only registers “4 results” for the same site search of Activity Yard. It would have almost been better if Bing’s result was at 0. Again, only one data point, but if this data point is directionally correct – Bing’s not even in the same galaxy as Google when it comes to spidering pace.